The 2018 Sonnet Special Edition is a celebration of founder George S. Parker’s passion and desire to travel the world. The SE celebrates George’s curiosity about his journeys and his reflection after his return. ‘Journey’ is inspired by the 2018 Duofold Limited Edition ($3,400). This design captures the LE’s graphics of the globe. ‘Reflection’, with its passport and postage stamps as inspiration, is designed to encourage perspective while retracing one’s recent journey. These two unique designs are lavished with laser etchings covered with translucent satin varnishes. Special materials such as palladium, sterling silver, and gold are highlighted. Explore each mode further for specific details. Even back in the early 20th Century there were pollsters. There were blindfolded "taste" tests. And these trials were not related to politics or food. They were related to fountain pens. And "8 Men out of 10 Picked the Duofold" over ten other competitors. The more times change, the more things remain the same. These historic Duofold Classic fountain pens, rollerballs and ballpoints would still be a top selection in today's world of fine writing. The Big Red (although somewhat more orange) is iconic in its representation of this earlier era. "…as your favorite pair of slippers!" Let's go back to 1963. A fine writing instrument was important as keeping your toes warm. Parker introduced the first Sonnet Cisele fountain pen during this time. A symbol of good taste which has endured over the years. Today Parker introduces some subtle changes to this iconic fountain pen, rollerball and ballpoint. The historic Cisele finish has a new clip design and center band. Most notably, a brand new Purple Matrix option, trimmed in rose gold, has joined the sterling collection. Let's go back in time, with a new twist perhaps? Parker has probably sold more of the iconic Jotter, than all the rest of the world’s sales added together. Since 1954, the Jotter has met our daily demands and then some. Now, it’s been enlarger by 7%. Long. Wider. A slightly larger size makes the Jotter XL comfortable for writing for long periods of time. Still the classic shape including the Parker arrow clip and that unmistakable ‘click’ sound when deploying the clip. Parker XL: A larger size providing more writing comfort for those who need it. Enjoy the pen that has more refill choices than any other. Your eyes don’t deceive you. Parker has built a Jotter in a fountain pen and priced the experience at just $30. Parker put their budget in the nib, of course. This premium stainless medium steel nib writes with the quality you would experience in far higher priced pens. Parker is aggressively courting the under $50 fountain pen lover, and they have hit a home run. As far back as 1959, Parker Jotter ballpoints sold out quickly. 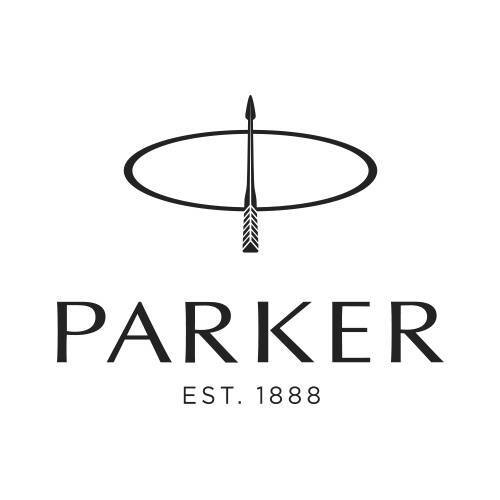 Parker urged its faithful customers to stock up quickly. We urge you to do the same. The Parker arrow clip has been updated and the famous "Jotter Click" has been fine tuned. Any variety of Parker-style refills shown below will customize the way your Jotter Premium writes. It's simple, all here on this page. What ARE you waiting for? Parker ballpoint pens are a one-piece twist to deploy design. The Parker ballpoint pen will accept an extremely broad selection of ballpoint refill technologies: standard ballpoint ink, GEL ballpoint ink, Liquid ballpoint ink as well as the Easy Flow technology from Schmidt. Some ballpoint ink choices come in as many as eight colors. Parker offers a wide variety of fountain pens in classic to new tech designs. Parker fountain pens are usually sold in fine and medium nibs, but a few models are available with a medium nib only. Parker offers fountain pens in both steel and gold nibs. All Parker fountain pens will accept Parker ink cartridges or can be used with a Parker converter and bottled ink. Parker rollerball pens feature a separate cap and body design available in a wide range of collections. Your Parker rollerball pen will accept Parker rollerball refills available with a fine or medium point, as well as a specially designed Monteverde refill.